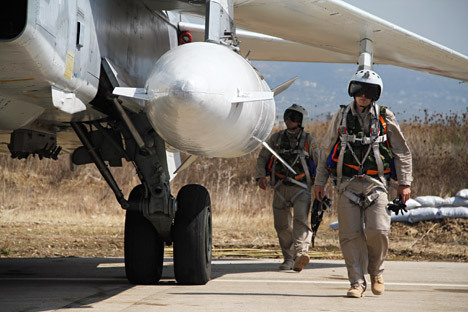 Russian pilots near a Su-24 aircraft before a mission, at the Khmeimim airbase in Syria. For three months already, Russia has been involved in a military operation in Syria it says is targeted against the Islamic State (ISIS) terrorist group. RBTH asked Russian analysts to estimate the cost of this campaign as well as its direct and indirect consequences. Russia’s bombing campaign against what it identifies as Islamic State (ISIS) targets in Syria is now in its third month, with jets continuing to take off day and night from the Russian air base at Latakia. Since the start of the operation on Sep. 30, according to the Russian military, over 4,200 sorties have been carried out and more than 2,000 targets destroyed by a task force consisting of more than 50 aircraft. However, the authorities have been reluctant to disclose how much each day of the Syria operation costs. “All the information is classified, while analysts’ attempts to calculate the costs result in outcomes that are not straightforward both from the point of view of methodology and final figures,” said Yevgeny Gnilomedov, head of the Prospective Analysis and Strategic Research Center, an independent economic analytics company. Finance Minister Anton Siluanov has indicated that the Defense Ministry operates within the existing budget and no additional expenditure is envisaged this year. At the same time, defense spending in the next year’s budget has been increased to 3,000 billion rubles ($42.6 billion), or 4 percent of GDP. Overall, the military operation in Syria has so far had an indirect impact on the Russian economy, though related events, such as Turkey shooting down a Russian bomber, have affected relations between countries, including economic relations. The Turkish Stream gas pipeline project, which was intended to supply Russian gas via an undersea route to a gas distribution hub in Turkey and then on to the Balkans, has in effect been frozen following the failure of Ankara and Moscow to reach agreement on the price of gas supplies to Turkey. Yet Russian analysts claim it is unlikely to result in real economic losses. “It is unlikely that the Turkish Stream project will be wound down over Turkey’s objections to Russia’s actions in Syria, primarily because Turkey is interested in gas supplies and would like to increase its role on the EU energy market once this project becomes operational,” said Ivan Kapitonov, an assistant professor at the Russian Presidential Academy of National Economy and Public Administration. Turkey receives some 60 percent of the gas it consumes (27 billion cubic meters in 2014) from Russia, according to Kapitonov, and despite other options technically being available, in reality Turkey will be able to substitute those amounts only once it has created a new infrastructure. Infographics: How is Russia keeping its planes safe in the Syrian skies? While many foreign businesses have left the Russian market over the last few years as relations with the West have deteriorated and Russia has slid into economic crisis, those who remain in the country are not displaying any signs of panic either, according to analysts interviewed by RBTH. “Large investors think in decades. From the point of view of decision-making, what matters to them more is the future of the oil price rather than military action in a region that is a hotspot as it is,” said economist Sergei Khestanov. Yevgeny Gnilomedov of the Prospective Analysis and Strategic Research Center agrees: “There has been neither capital flight nor transfer of assets,” he said. Having said that, he continues, individual events can have a short-term influence on the oil price and the value of Russian equities, as well as on the ruble’s stability against other currencies. Experts polled by RBTH point out that the real-life display of Russian military capabilities has given the country’s defense sector an opportunity to promote its products on the global market. “The Aerospace Forces’ busy activity, the use of various weapons and the visible results they achieve, which hardly anyone doubts any more, allow one to conclude that Russian weapon systems and ammunition are indeed effective,” said Gnilomedov. According to Gnilomedov, in future this may result in new lucrative contracts for the Russian defense sector. Konstantin Makienko from the Center for Analysis of Strategies and Technologies partially agrees. He cites NATO arms exporters’ practice, whereby they always stress that their weapons are “combat proven.” In Syria, Russia is using, among other things, Su-24 bombers and Su-300SM fighter aircraft. “Now that these weapon systems are combat proven, their competitive ability is considerably higher,” said Makienko. Having said that, he adds, it is impossible to trace a direct link between specific combat operations and contracts. At present, the biggest importers of Russian arms are India and Iraq. In Yevgeny Gnilomedov’s view, the principal advantage for the domestic industry overall may emerge only later, if the operation in Syria is a success. “The country’s devastated infrastructure will need to be restored and Russian companies should do everything in their power to ensure their involvement in those processes for years to come,” he said.